As Business Capabilities are directly derived from the corporate strategic plan and are designed to satisfy the enterprise’s business strategies, goals and objectives, so they provide an excellent basis for the creation of an Enterprise Architecture Roadmap. Many Enterprise Architects and organisations fail to really use them, but in fact they are slowly becoming a common EA deliverable and a way of developing a target operating model view. The key to their increasing popularity is because the Business Capabilities are expressed in terms of business outcomes and value rather than in purely functional or IT terms (i.e. Not just in terms of business unit needs or in terms of IT Solutions) thereby ensuring IT alignment with the business. Being expressed in terms of outcomes and values also means that Business Capabilities are tied to the outside in perspective of the Customer Journey and Strategic Scenarios, rather than the inside out perspective. A good book to read about the outside in perspective is “Outside In: The power of putting Customers at the Center of Your business” by Harley Manning et al.http://www.amazon.co.uk/Outside-In-Putting-Customers-Business/dp/1477800085/ref=sr_1_1?ie=UTF8&qid=1371351364&sr=8-1&keywords=outside+in. In this way a Business Capability can be seen as a cross cutting slice through a typical enterprise architecture model. A Business Capability is used for managing units of strategic business change and providing the mandate for programmes and project portfolio. Subsequently, project will develop a solution that either creates a whole new Business Capability or updates a Business capability by implementing a Capability Increment. Thus, Business Capabilities and Capability increments provide the basis for the development of the EA Roadmap. This diagram illustrates the start point for a Business Capability Model. This is a static view based on the style of IBM’s Component Business Model. This is a style diagram that has become quite popular. The whole matrix represents all the Business Capabilities that the organisation performs. 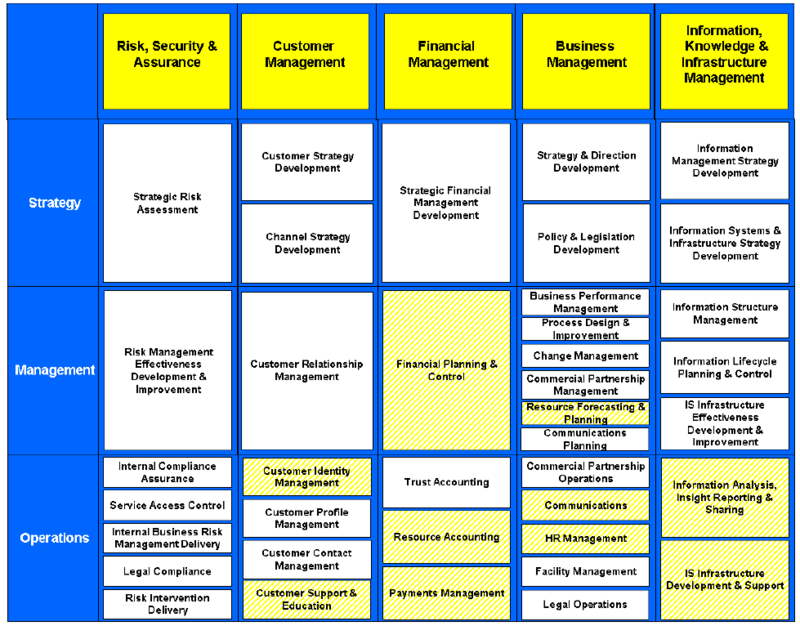 Each cell is a Business Capability. The Columns usually reflect the high level value chain for the organisation or are major groupings of Business Capabilities that are meaningful to the business. Business Capabilities also have dependencies between them. I.e. one Business Capability has to exist before another Business Capability can be achieved. Implementing Business Strategies requires new or changed Business Capabilities, but for the most cases we are just changing some aspects of the Business Capability rather than introducing brand new ones. This is the Capability Increment. The diagram above shows the relationships between Business Capabilities and Capability Increments, and also related the Enterprise Architecture development method phases and definition of work packages for the Programme and Project Portfolios. Capability Increments document the changes to each Business Capability that are needed to implement the Business or IT Strategies. Each Business Capability is decomposed into one or more Capability Increments that are typically implemented at different points in time and in different Transition Architectures. Each Capability Increment represents a unit of change. Capability Increments also have dependencies between them. I.e. one Capability Increment has to be implemented before another Capability Increment can be achieved. 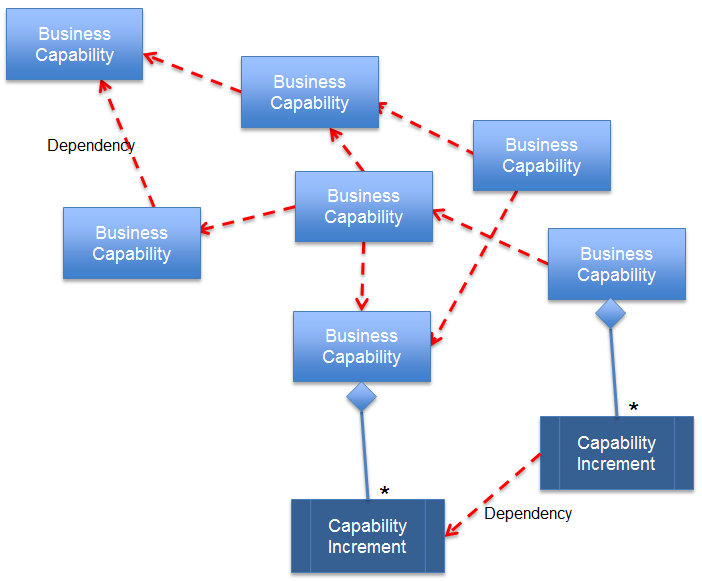 The diagram above shows the dependency relationships between the Business Capabilities and between the Capability Increments. The Capability Increments can be rearranged to show the dependency order in which they need to be applied. This sequence forms the basis for the EA Roadmap. Often it is may be useful (and politic) to represent several tracks in the EA Roadmap. For example tracks may be introduced for Strategic changes, Business changes and IT changes, since Capability increments may be identified in such a way that they can be implemented in parallel. 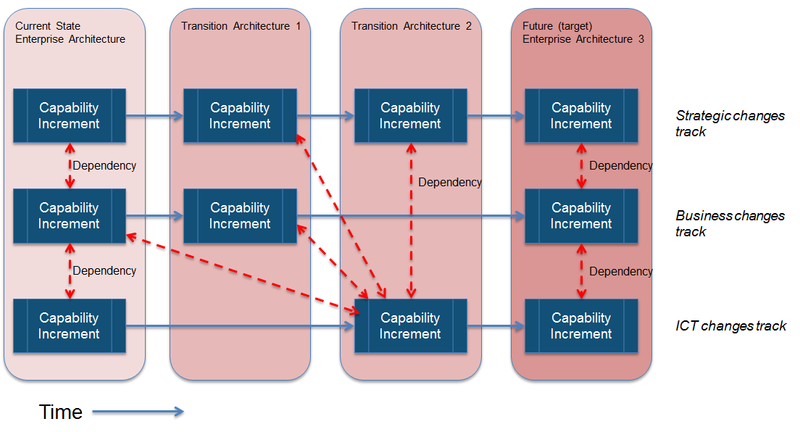 The Capability Increments can be grouped into Transition Architectures. A Transition Architecture is an intermediate Architecture model somewhere between the current state and the future (target) state Enterprise Architecture model being aimed for. A Transition Architecture will typically be aligned to intermediate and temporary stages in implementation. Groups of one or more Capability Increments will provide the mandate for a solution or service to be developed in a project. A Business Capability Model should be at the core of all Enterprise Architecture Models. Often the Architecture Vision Model or Core Model is produced as a Business Capability Model to provide a strategic view that helps all stakeholders in an organisation to develop a common understanding of what needs to be done and what needs to be changed.